When it comes to our love of food, there is always one thing Jess and I can most definitely agree upon…charcuterie and cheese boards are hands down our favorite appetizer. Sometimes we even make them into a meal! There are nights when we don’t want to turn on the oven or spend time waiting for food to cook. That’s the beauty of a meat and cheese platter! You get to skip all that. Just pick a few types of meat, a couple of cheeses, then throw in some crackers and bread…and bam, you’re good to go! It’s so simple and delicious! 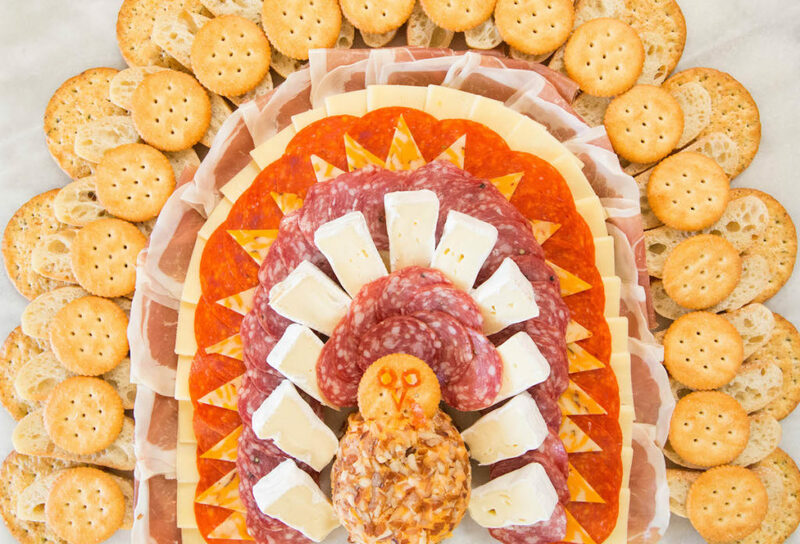 When there’s a holiday involved, obviously your meat & cheese platter has to be themed. There’s no way around it! Thanksgiving, Christmas, Halloween, Fourth of July…just give me a reason to go a little over the top and present different foods altogether in the shape of a turkey, Christmas tree, skeleton, or American flag. Putting them together is seriously one of my favorite past times! 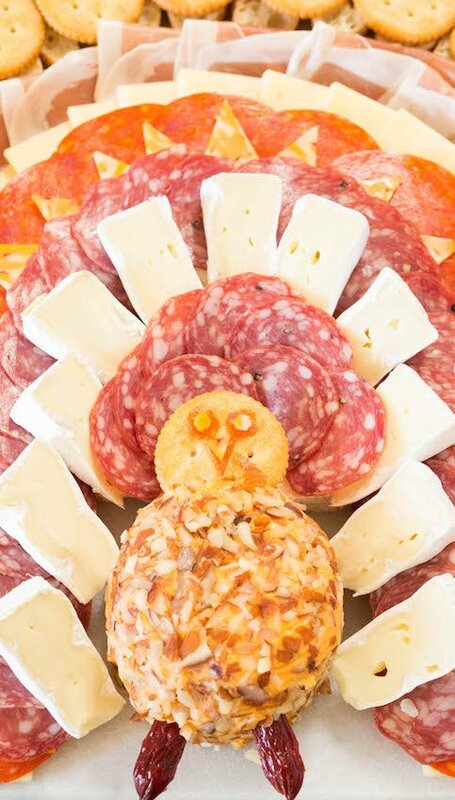 I plan on knocking everyone’s socks off this Thanksgiving with a giant meat and cheese platter in the form of a turkey. The best thing about it? It’s so easy to put together! No cooking involved! Everything I bought was from my local grocery store. You can choose to get the meat and cheeses fresh from the deli or there are plenty of packaged meat and cheeses that will get the job done. Options are key. As you can see, I used three different types of crackers/bread, three types of meat, and four different cheeses. The more, the merrier, I always say! The beauty of a meat & cheese tray like this is that you can customize your it to your liking. Don’t like brie? No problem! Pick any other cheese! Not a fan of soppressata? Nix it and go with a different sliced meat! One last thing – it’s the holidays, so you have to have a cheese ball. I’m not forcing you to do anything but let’s be real, those balls are soooo good! And I used it as the anchor to my platter. When thinking about what to make the turkey’s body out of, that was the only thing that seemed right. I think it turned out pretty great! My Rhodesian Ridgeback/Red Lab mix, Socora, seemed to think so too. She patiently waited in the wings (out of sight out of mind) for hours for me to finish building and taking photos of this completed platter before I turned my back for 2 seconds and she very stealthily ate almost the entire cheeseball! I was worried she might get sick, but luckily she has an iron stomach and was not fazed. Also, it’s a good thing I bought a backup cheese ball so I could actually enjoy some myself! ? I also cut out eyes, a beak, and snood (yes, that’s what it’s called!) from an extra pepperoni and piece of Colby jack cheese, then placed it on top of a ritz cracker for the turkey’s face. The legs are made out of a halved smoked sausage we had at the house already. That’s the other cool thing about these sort of creations, just add in things you have already available to you! And if you really want to go all out, add some honey and jam, olives, and an assortment of mixed nuts and really blow your friends minds! Let us know what else you would add to take this platter to a whole other level. You can’t go wrong! 20 Ritz crackers, one set aside for the turkey head/face. 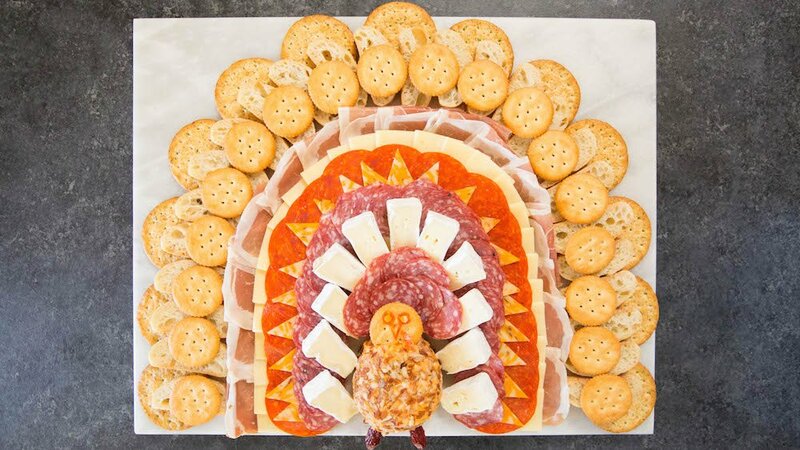 Begin by placing your cheeseball in the very center and bottom of your platter. Now starting from the outer edge place your crackers in a semi-circle around the cheeseball. Add the bread and Ritz crackers on top of the large crackers. In the same fashion, layer the prosciutto, white cheddar cheese, pepperoni, Colby jack cheese, soppressata, and brie. To fill in the area above the cheese ball, add leftover brie wedges and soppressata. 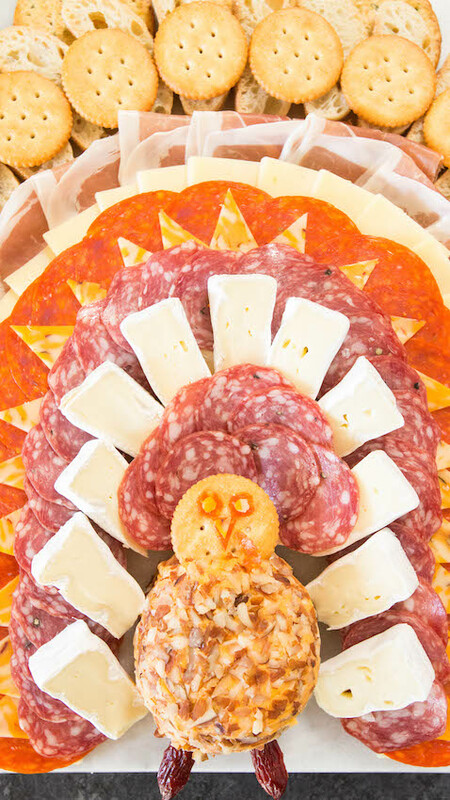 Stick one Ritz cracker in the top of the cheeseball for the turkey’s head and place the eyes, beak, and snood on top. Insert the smoked sausage for the legs.